Keeping Time is an investigation into the communication between woven and musical structures with my computer-assisted AVL loom and Livecoding. 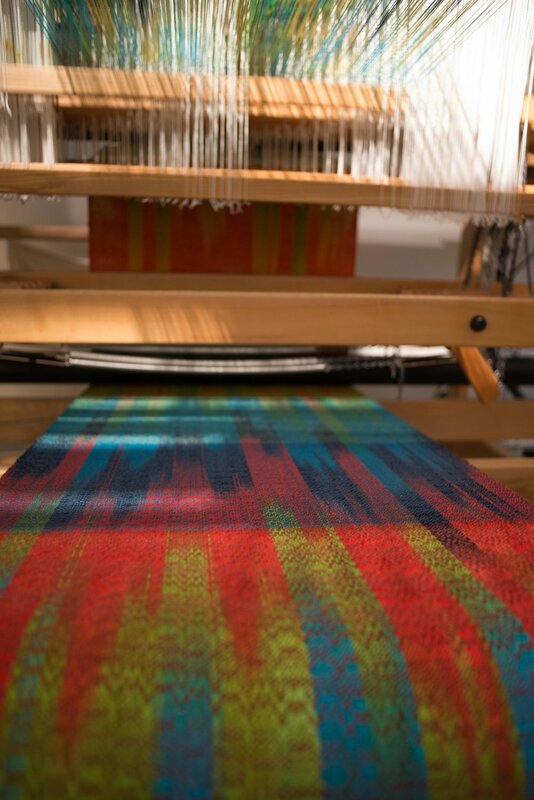 Weaving on my loom utilizes groups of threads that express pattern (unlike industrial jacquard looms, where individual threads can be controlled to create image). Because my loom uses a computer, I can manipulate and change the pattern algorithm at any time. Livecoding, a fairly new music genre, includes using computer code to express musical sequences, changing sound by manipulating and improvising coded patterns through live response. Together, these cycles, rhythmic gestures and emergent patterns provide the framework for creative response and live action weaving. Using Livecoding improvisation with my loom celebrates the very nature of weaving as a practice and plays with mechanics in way that makes weaving into an experiment. Through collaborative research, I have developed a team of programmers and technicians that have enabled me to recontextualize my weaving process into a musical performance. Musical notation and weaving pattern drafts are fused in an attempt to explore something unpredictable, how rhythm, process and line can create both musical scores and cloth. Weavings complement the rhythm of process and notation with visual rhythms of color and line.